If you've been following Get Bizzy Living's facebook page, then you may already know that I recently acquired my first-ever bag of quinoa. I know, I know, I'm late to the party. 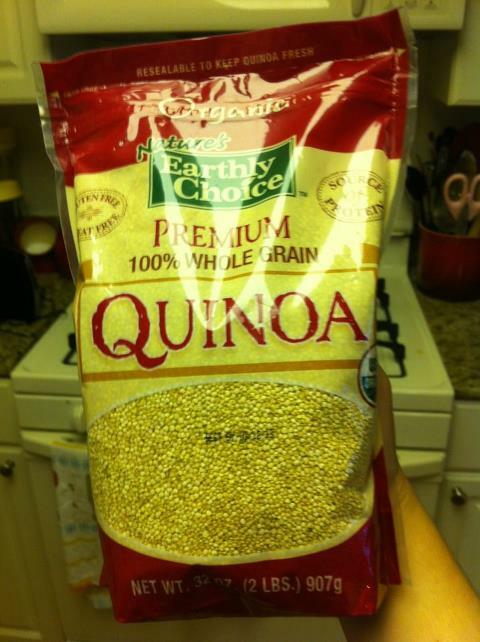 People have been raving about the awesomeness of quinoa for quite some time now. But for the longest while, something about those tiny little pinhead-sized grains made me nervous. I had no idea how to cook them, let alone what to actually do with them (okay, okay, you eat them - but with what? And how?? How, I ask you??). I'm glad that I finally overcame my apprehension, because these little beads of goodness are amazing. And super good for you. Quinoa is gluten-free, it's a great source of good protein (containing all of the amino acids), and it's rich in calcium, potassium, iron, and and zinc among other important minerals (source). Beyond that, it's thought to be wonderful for the cardiovascular system, a great antioxidant, and get this - a natural relief for migraines (source)!!! Seriously, where has this stuff been all my life? Suffice it to say that in the past week I have become very "keen" on quinoa. And I hope that after this post, you will be too! I wanted to start off with a simple recipe to introduce me (and in effect, you all) to the world of quinoa. So off I went to the Weight Watchers' recipe board, and came across this little number. It was very easy to make, it tasted amazing, and it would pair up like a dream with basically any entree. Oh, and it's only 3 points for a half cup serving. And since quinoa is chock-full of essential protein, you don't need a lot to feel sated. A win all around! Our crazy cast of characters. That odd red thing in the background is our olive oil vessel. 1. Heat oil in a large skillet over medium-high heat. Add onion and garlic, and stir until well combined and tender (3-5 minutes). 2. 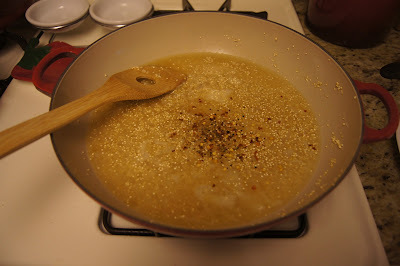 Add quinoa, stir until quinoa begins to turn golden brown (2 minutes). 3. Add broth, pepper, and red pepper flakes. Bring to a boil. 4. If you have any leftover chicken broth, put it in your favorite mug, microwave it on high for a minute, and sip away! 5. Cover skillet, reduce heat to low, and let simmer for 12-13 minutes. 6. Add the spinach, and stir until well combined. Cover the skillet again, and cook until everything is tender and the liquid is absorbed. Add salt. 7. Serve with chicken, fish, or whatever you want! Yields about 1/2 cup a serving. I served it with a chicken breast, because that's my M.O. these days. For the record, I halved the recipe since I was only cooking for two. I also omitted the garlic because I'm not the biggest of garlic fans (but I'm not a vampire, I promise). Feel free to do the same - it doesn't seem to affect the yummy taste. I can already tell that quinoa will now be a staple in Bracks' and my diet, and it makes me so very excited. I mean, hey - it's easy to prepare, it has a plethora of health benefits, and it's fun to say. That's a triple threat in my book. Note: We don't use the cream (even though it's not much), instead we add a bit more olive oil and some near-boiling water. We always add basil. Also, I chuckled out loud at your "keen quinoa" word play. Lovely. Awesome!! I cannot wait to try this one out! Thank you so much for sharing! Oh, and almonds are killer, but toasted walnuts offer a complex, more earthy flavor as well and are a bit less expensive. Yum! Hehehe - honestly, basil is one of the greatest natural ingredients out there, as far as Bracks and I are concerned - so, right on! Maybe when we make it we'll put feta AND basil! And walnuts/almonds are a great and healthy call - an amazing addition that would be super complementary to the quinoa's distinct taste. I can't wait to try your recipe! Thanks again! !